Thousands of OFW’s send Balikbayan Boxes to their loved ones back home in the Philippines, and to save them from the hassle, here are some of the new guidelines from the Bureau of Customs. BOC estimates losing around 50 million pesos worth of taxes each month from the Balikbayan Boxes. Many of the packages are not for the personal use, and instead for business purposes. Agaton Uvero, the BOC Deputy Commissioner for Assessments and Operations, had given an example that 10 Balikbayan boxes could be addressed to one consignee and these boxes contain perfumes and watches for selling. This is clearly for business. 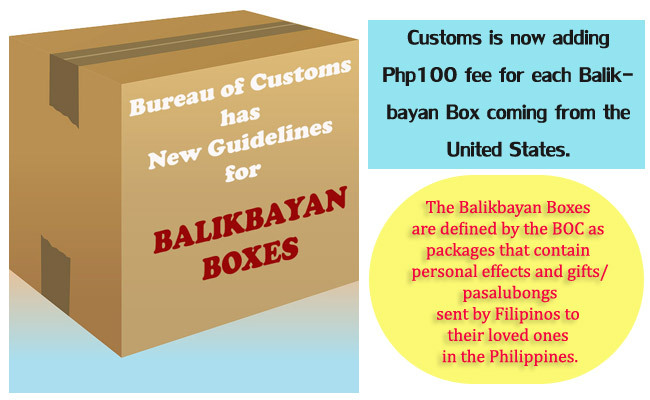 Customs is now adding Php100 fee for each Balikbayan Box coming from the United States. Only one box can be sent to a consignee. Customs admitted that they could not inspect all of the boxes, but they will be conducting random spot inspections. BOC reminded the senders to list the contents of the box before they send it to the Philippines. The bureau is still polishing the guidelines and expects to finalize the new list by October 2015. The Balikbayan Boxes are defined by the BOC as packages that contain personal effects and gifts/ pasalubongs sent by Filipinos to their loved ones in the Philippines. However, there are some limitations on what can be sent. Only non- commercial goods of goods only for personal quantity can be sent. The value must not exceed $500. Each Filipino residing in another country can only send one box every six months. And an examination by BOC is required by the law. This is a step to prevent smuggling or other fraud activities. Goods in commercial quantity is strictly forbidden and might cause the delay in shipment as it will be deemed questionable. Motorcycle parts or parts of a motor vehicle, however detached, is also not allowed as it is not a household good or a personal effect. If they are needed to be sent, proper documentation must be done.